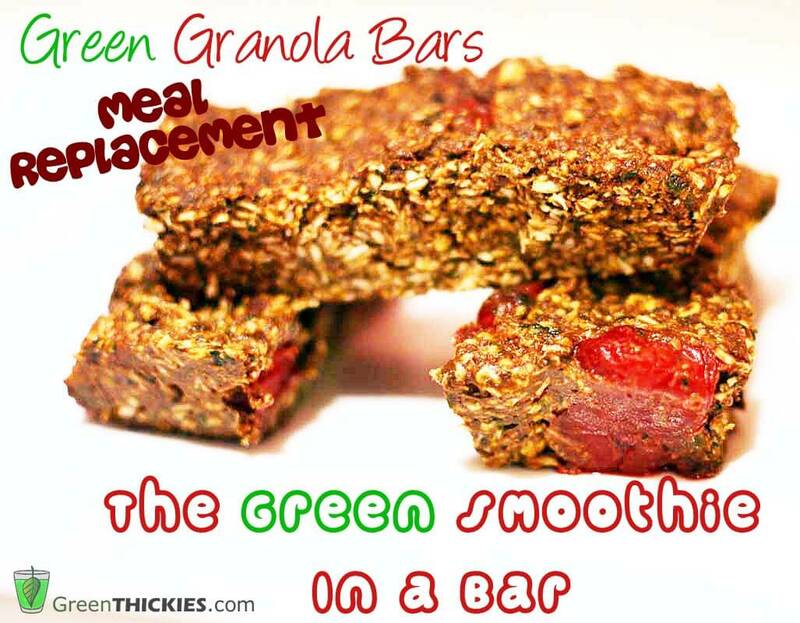 Green Thickie’s Raw granola bar recipe: The filling Green Smoothie in a bar! Green thickies have just got even more portable. 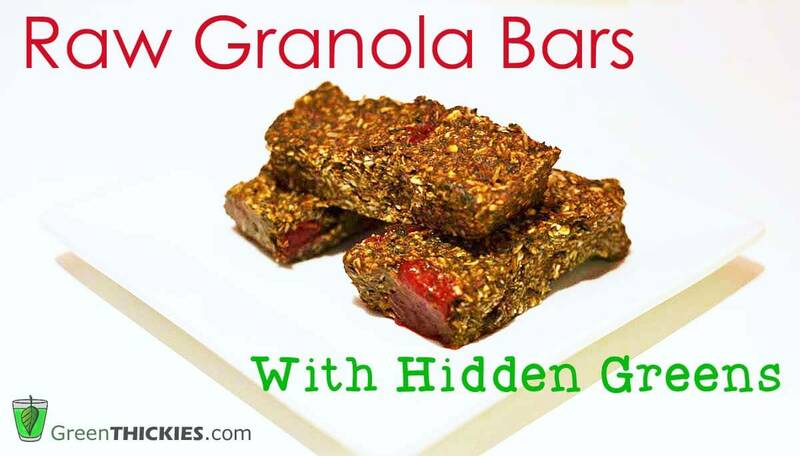 Enter the Green Granola Bar Recipe! You can now have your green smoothie in bar form! 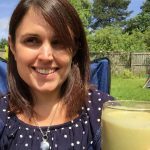 I have wanted to make a green smoothie bar for such a long time and I’ve only recently got around to it. So after testing various recipes, I finally have a granola bar recipe that I am happy with and I’m sure you’re going to love it. Green thickies are already fairly portable. You throw your big filling smoothie into a massive container and drink it wherever you are. It’s a meal on the run. 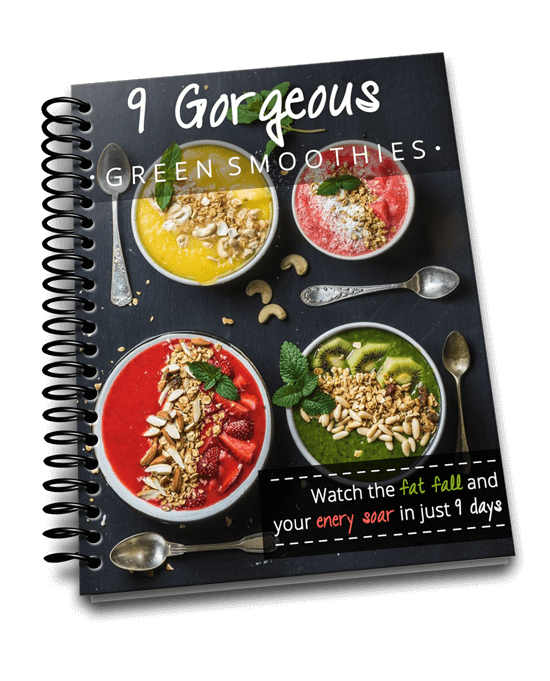 But, what if you want something even more portable, smaller, more compact, longer lasting but still want your fresh dose of daily raw energising greens, nutritious fruit, protein packed nuts/seeds, and filling oats. You’ve come to the right place today as this recipe ticks all the boxes. Did I mention it also tastes sweet, gorgeous and not a hint of any taste of greens? This bar doesn’t taste healthy, but it is. You can give it to your kids, friends and family and they’ll be none the wiser that this moreish granola bar contains anything even remotely healthy. You can rest assured there are no nasties lurking in this bar, and it comes together pretty quickly. 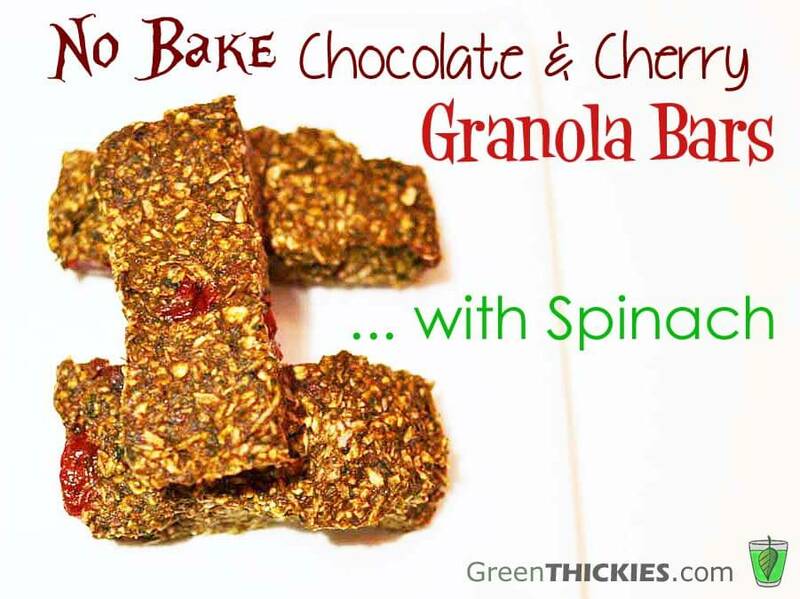 This granola bar recipe is chocolate and cherry flavoured which is one of my favourite combinations, but it’s a very flexible bar. You can substitute the cherries for any other fruit and leave out the chocolate completely. It will still work. You can also replace the seeds with nuts or oats, add in any mild greens you want or leave them out altogether. The choices are endless. You also have a choice about how raw you want this bar to be. To retain all the nutrition, leave it raw, you can eat it from frozen, or from the refrigerator. Or dehydrate it to keep the nutrition but maximize the longevity. You can also bake it in the oven which will kill some of the nutrients but make it last longer and be more flexible for travelling. The consistency of the raw bar is fairly soft, but it holds together fairly well if it’s wrapped up. The best way to eat it raw from the fridge is to break chunks off with your fingers as it can flop a little bit if you tried to bite into it. It is harder eaten from frozen. If you want to harden it up and make it more of a substantial and portable bar, either dehydrate it or bake it. 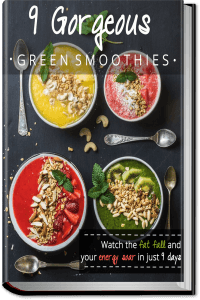 The only thing this ‘green smoothie bar’ is missing is the water, so if you are using this as a meal replacement make sure you pack some water to take with you. 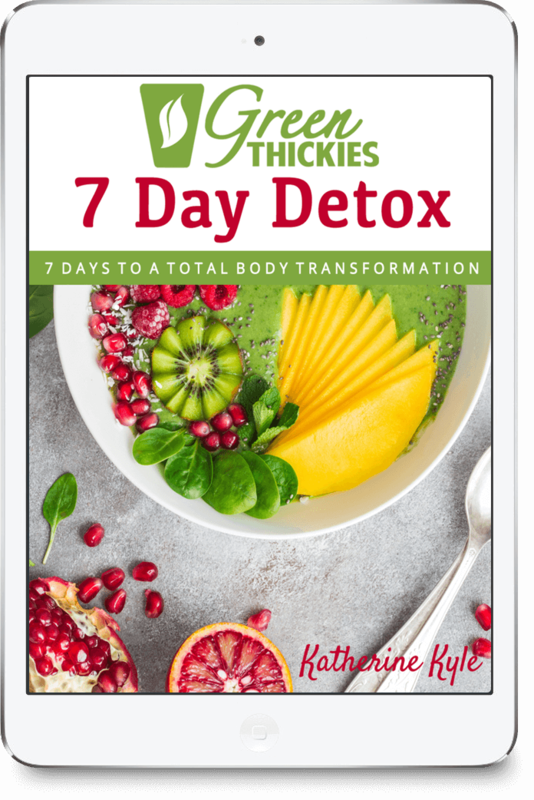 I have tried to keep the ratios of ingredients very similar to a green thickie, so that when I calculated the calories it turns out that half of this entire recipe is about 500 calories, the same as an average green thickie. So these bars can be used as a complete meal but you need to eat about half of them, or as many as it takes to fill yourself up! 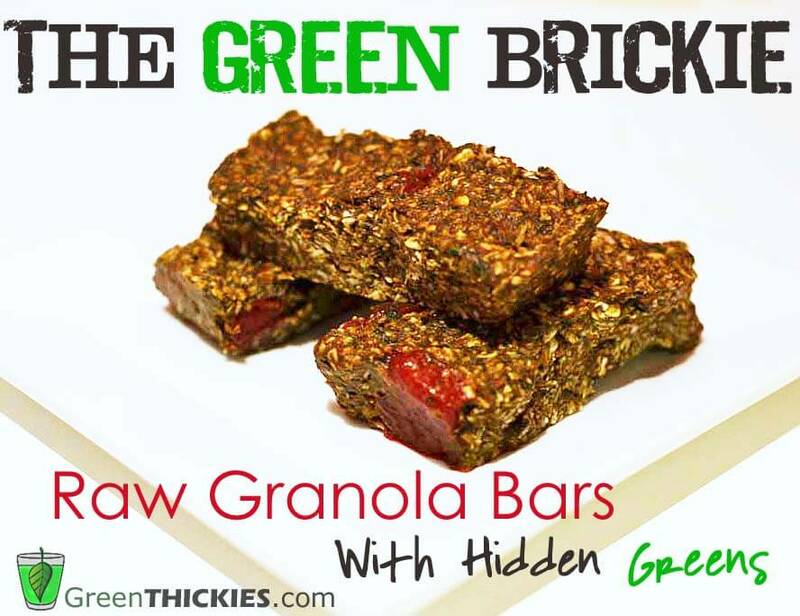 UPDATE: I was just telling my husband about my green smoothie bars and he suggested I call them Green Brickies. I love that name! So the GREEN BRICKIE is born. I’m going to get to work creating some different flavoured bars so I can have a series of Green Brickies! Add the date paste, carob powder, ground flax, HALF of the cherries (1/8 Cup), greens, salt and dried coconut to a food processor and process for a couple of minutes or until well mixed and the greens have been well broken down. Stir in the oats and the other half of the cherries (1/8) until well mixed. The RECIPE for DATE PASTE can be found here. These look delicious Katherine! Love the cherries, and how you actually put whole greens in! I’ve seen powdered greens and algae in bars before, but never the greens themselves. very cool! Thanks Gabby. Yes I did search the Internet to see if I could find a recipe that included whole greens but couldn’t find anything so just had to experiment. I was so glad they worked (after a couple of attempts) I just realised my oven goes down really low almost to 115degrees F so am currently ‘dehydrating’ some and they are working very well. I’m excited to try other dehydrated recipes now but it takes forever! YUM! These sound and look delicious!! Very impressive – may be a great way to try to sneak some more green veggies into my son! I hope to give these a try. Thanks again for your kind words over at nomyumfree.com. Have a wonderful week, and see you at this week’s Healthy Vegan Friday!! Thanks Devin. Yes the more we can be sneaky with greens the better! I hope you enjoy them. Have a great week too and I’ll look forward to seeing your posts on Healthy Vegan Friday! Oh so glad you thought of this! I have 2 young picky oys (4 & 1) cannot get the oldest to eat any salad. He has Autism so his picky eating is super super picky! But he loves chocolate and sweets (what kid doesn’t!) Going to make these this week! Get some goodness into them. Thank you!! Love your site by the way. An inspiration! Thank you Maria, that’s so kind of you. I know the feeling, my toddler has become very picky and the foods she will eat are very limited now. Thankfully she still drinks the green thickies but rarely touches any cake or sweet treat like this. It’s hard when they won’t touch your healthy foods. I really hope your boys enjoy them! These bars look great! A perfect breakfast on the go :) The green addition is an awesome idea, and I guess you could use any dried fruit instead of cherries? Hi Nat, thank you! Yes I’m sure any dried fruit would work just as well. I need to get experimenting a bit more with these bars! Thank you Elena! I must get making some more of these myself. Hi Katharine! How long do you recommend baking them for if I decide to bake? Thanks! I love no-bake bars! This would make a perfect pre-work out snack for me, thanks for sharing. I just made this recipe and love it! It’s not too sweet, which is fantastic for my taste. But beware that when I put all the ingredients into a calorie counter, I get about 1200 calories for the total recipe, not 546 as is listed. My only change to the recipe was to use dried cherries rather than fresh, so that may account for 100 calories. 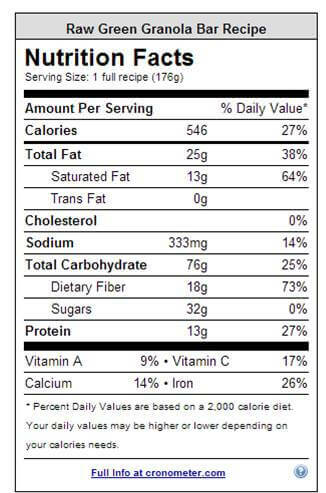 The oats alone are 300 calories, and the coconut is 260-300 calories depending on which calorie website you use. That’s not even counting the date paste (which is a high calorie item!) or the flax or the cherries or the cocoa. Fantastic recipe–but just know you’re getting way more calories than listed. Hi Pam, thank you so much for your comment. I’m so glad you liked it! I had mentioned in my blog post that half of this recipe is around 500 calories so that would match up fairly well with your calculations. Sorry if this wasn’t clear on the actual recipe. Thanks for sharing such a great recipe! If I want to use frozen spinach, how much of the whole pack should I use? Do I need to squeeze the water out first? 20 mins in a fan oven burns this so I would say 10 mins should suffice!